This weekend only! 50% off registration with code NEWYEAR. We will meet on four consecutive Wednesdays in January: 1/2, 1/9, 1/16, and 1/23 from 6:30-9pm at the Bliss Center. -We will build a container for this work together by closing the group after the 2nd session. You may miss the Jan. 2nd meeting, but are asked to attend the following 3. -The regular registration fee of $110 covers the cost of attendance and materials. -You are encouraged to register in advance but may come (and bring friends/family) on the day of. All payments must be made in advance at the link below, even if its just moments before the start of class so that we can keep business out of the container we are building together. Healers, mental health professionals and emotional caretakers get 50% off registration! All registrants can invite friends for 25% off. Send a message for registration codes. Liberty has been teaching communication skills in groups for the last 7 years and is currently studying Depth psychology with an emphasis on community, liberation, eco and indigenous psychologies. A practicing life coach for creative change agents, Liberty strives to cultivate an atmosphere for group trust and intimacy. As an RYT-200, Liberty also integrates breathing techniques and stretches for empathic success. Liberty is new to St. Louis and looking forward to connecting with a new community! Join us in this free event! 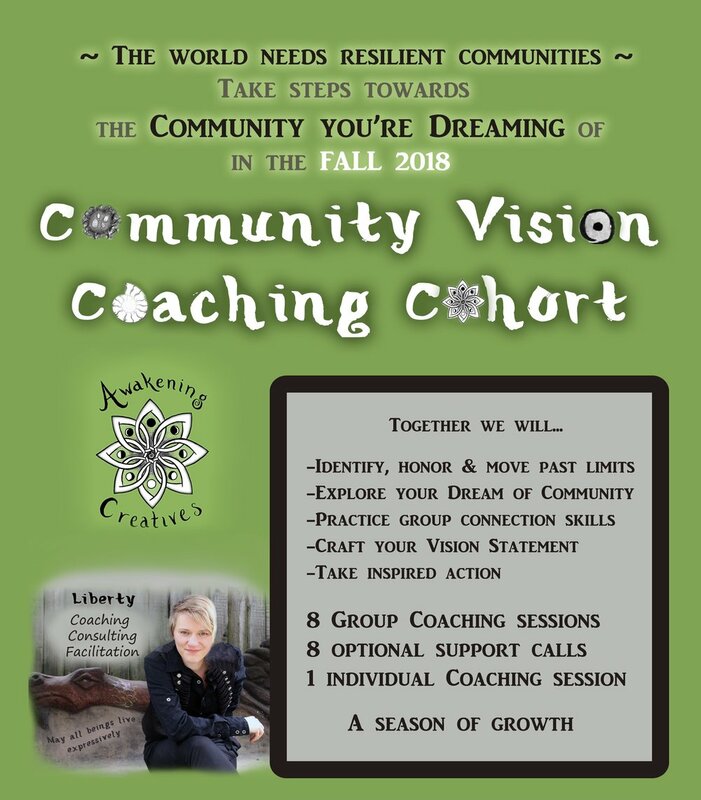 Liberty, Holistic Creative Life Coach works with creative change agents who are overwhelmed or having trouble prioritizing to connect with your natural rhythms which lead to powerful, balanced action. Dakota, LMT #22331, multi-talented practitioner, weaves myofascial release, chinese reflexology, acupressure, deep tissue, reiki and more into transformational bodywork. I suffer from SAD, seasonal affective disorder. This means that each winter I experience lethargy, negative thinking patterns, an increase in unhealthy behaviors and a general sense that things are "not okay." Over the years I have learned to recognize it for what it is and not make it a part of my identity but instead adopt it as a seasonal guest who I have the pleasure of getting to know and hosting with increasing curiosity and compassion. This of course is always easier said than done. This year, with the encouragement of my counselor and my partner, I listened to the message of the lethargy and allowed myself space to rest. I listened to the negative thinking patterns and allowed them to be heard and acknowledged (without letting them run the show). I noticed when unhealthy behaviors arose and gave myself compassion for them when I could. I let myself truly experience the SAD instead of denying, fighting it or wishing it away. I consistently reminded myself that it was temporary and my creative spirit needed this time of regeneration. This seemed counter-intuitive to the "blast-everything-with-blinding-light" approach I've attempted in previous years which suggests that if I simply "immerse myself in an all-loving pool of infinite love and light" that all will heal and be merry. That never worked for me. Why? Because nature doesn't work that way. At least not the planet that I live on where there is a significant percentage less light reaching the ground daily in the winter. It was important for me to allow certain realities to be present while also doing what I can and know how to do to improve my quality of life with my resources. This is a Camelia Japonica, cousin of the Camelia Sinensis, the tea plant. This is a plant family that I work with closely every day and in my primary meditation practice of tea pouring. When I spotted the flower I walked over to it and I clearly got the message, "Even in the dead of winter can the fertile heart blossom." I was taken aback, looking around seeing all of the other naked plants looking lifeless, yet this plant flowered as if to say "it doesn't matter what time of year it is, if the creation is ready it will come. I was reminded that I am not always in control of what happens in my life and while that can be terrifying and frustrating, it can also be pleasantly surprising and joyous. I left the flowing plant, acknowledging its beauty and also recognizing that it, too, is temporary. When it is done blossoming the flower will wither and move on to another stage of its own creativity. This is its nature and my creative nature will follow suit it the unique rhythm of its own. Rest assured my heart will blossom again. And it did, which is why I am writing this journal entry after several months of wintering over. There are still months to go before the first signs of spring on the surface, but just like any good compost pile, the warmth starts in the center. I can feel the creative seeds stirring within and my trust in the process is renewed. Perhaps my SAD friend can feel it, too. When we are children most of us has access to a level of creative play that keeps us in a state of wonder, joy, and non-judgement. It is our responsibility as we age to discover ways to maintain our access to this creative abundance. Make it a practice to re-create this state, to recreate. Make it a practice to reconnect with that state of wonder, joy and non-judgement with each step of the creative process. Love every part of your creative process, especially the failures.